Recombinant human erythropoietin (EPO) is approved by the US Food and Drug Administration (FDA) for treatment of anemia in patients with chronic kidney diseases and chemotherapy-associated anemia . A growing number of studies indicate that EPO also provides therapeutic benefits other than its role in correcting anemia. It effectively inhibits the production of pro-inflammatory cytokines and also reduces the production of reactive oxygen species (ROS) and membrane lipid peroxidase ,. Some studies have demonstrated the positive effects of EPO in treatment of acute and chronic skin wounds and burns in animals and human ,,. For instances, Galeano et al. reported that subcutaneous administration of EPO in mice with deep-dermal second degree burn increased burn wound re-epithelialization and reduced the time to final wound closure . In another animal wound-healing model, topical treatment of the wounds of diabetic rats with EPO-containing cream decreased the extent of apoptosis and the areas of the open wound . Ferri et al. reported that systemic EPO treatment is beneficial in cutaneous ulcers in patients with systemic ulceration . Recently we developed a novel thermosensitive hydrogel containing EPO for prevention and treatment of oral mucositis (OM) . OM is inflammation of oral mucosa of cancer patients as a result of radiotherapy and/or chemotherapy . Our developed formulation successfully decreased the severity of OM in animal chemotherapy-induced OM model . Thermosensitive hydrogels exhibit solution to gel transition when the ambient temperature changes to physiological level. These hydrogels can, therefore, be conveniently administered as solution which swell and turn to a gel relatively shortly after their application. The so formed gel will have the advantage of prolonged drug release in the surrounding medium improving patient compliance owing to the reduced frequency of medication administration. However, hydrogels do not have enough stability in liquid form and they gradually convert to semisolid at room temperature and even in refrigerator. In the current study, we aimed to evaluate the effect of freeze drying on thermo-responsive property of the hydrogel and conformational structural stability of the loaded EPO. The characteristics of the freeze-dried EPO-loaded hydrogel were determined using various methods. Gelation property by rheological analysis, aggregation of EPO in the formulation by sodium dodecyl sulfate polyacrylamide gel electrophoresis (SDS-PAGE), the protein secondary structure by far ultraviolet-circular dichroism (CD), and the antigenicity activity of EPO with ELISA techniques. The healing effect of the freeze-dried formulation was also investigated in vivo in Sprague-Dawley rats with chemotherapy-induced mucositis and compared with freshly prepared mixture. Finally, the retention time of the gel in the oral cavity was investigated in healthy volunteers. Trimethy chitosan (TMC) with 5% degree of substitution and molecular weight 150-300 kDa was synthesized in our laboratory. β-glycerophosphate disodium salt (GP) was purchased from Sigma Chemical Co. (St. Louis, MO, USA). EPO was obtained from Pasteur Institute of Iran (Tehran, I.R. Iran). Potassium dihydrogen phosphate and sodium hydroxide were procured from Merck (Darmstads, Germany). Human EPO platinum ELISA kit was supplied by eBioscience (Vienna, Austria). EPO solutions of 300 IU/mL were mixed with TMC solution. GP solution was then added to the mixture to obtain EPO-loaded hydrogel containing final concentrations of TMC (5% w/v) and GP (20% w/v). The mixture was prepared at 4 °C and under constant stirring . The rheological behavior and mucoadhesive property of EPO-loaded TMC/GP system was evaluated using digital rotary viscometer (RVDV-III U, Daiki Sciences Co. USA) and tensile stress tester (TA. XT plus Texture Analyzer, Stable Micro system, Godalming, UK), respectively following procedure described previously .To evaluate the release profile of EPO, 1 mL of the hydrogel solution containing EPO was placed in 25-mL flat-bottomed glass beakers and allowed to thicken in an incubator at 37 °C for 5 min. Then, 30 mL phosphate buffer solution (PBS 0.1M, pH 6.8) was poured on the surface of gels and the vessels were shaken in a water bath shaker at 40 rpm and 37 °C. The samples were taken from the release medium at the predetermined time intervals and replaced with fresh buffer. EPO in the supernatant solution was assayed using human EPO platinum ELISA kit, as directed by the manufacturer . The freeze-dried samples were prepared by immerging a polytetrafluoroethylene tube containing EPO-loaded TMC/GP solution into liquid nitrogen for several minutes to let them freeze, and then the frozen sample was lyophilized by a freeze drier (Christ Alpha 4.2 LD over, Germany) at -40 °C and a pressure of 0.4 bar for about 48 h . To study the thermo-responsive behavior, the powder of the dried polymer was first equilibrated in deionized water at 4 °C and then temperature was increased to 50 °C. The bioadhesive property and the release rate of EPO were also examined as described earlier. The secondary structure of EPO released from the hydrogel was investigated by CD spectroscopy. The CD spectra were obtained at room temperature using a J-810 spectropolarimeter from Jasco, Inc. (Easton, MD, USA) under following conditions: cell length, 1 cm; scanning speed, 100 nm/min; data pitch, 0.5 nm; sensitivity, standard; band width, 1 nm; wavelength range, 190-300 nm (far UV). CD pattern was compared with CD pattern of standard EPO set as the default in equipment software database. ELISA assay was used for estimation of EPO antigenicity after 30 min exposure of EPO-loaded hydrogel to release medium. The incubation temperature and release medium were the same as those used in the experiment for EPO in vitro release study. Thirty min after incubation, the incubation medium was withdrawn and analyzed for antigenic activity of the protein using EPO ELISA kit. The structural integrity and possible aggregation of EPO following loading and freeze drying processes were investigated by SDS-PAGE. An aliquot of the samples of EPO released from freeze-dried, freshly prepared samples during the first hour of in vitro studies, and several molecular mass reference standards (14400-116000 Da, thermo scientific protein marker 26611) including lysozyme (14400), β-lactoglobulin (18400), restriction endonuclease (25000), lactate dehydrogenase (35000), ovoalbumin (45000), bovine serum albumin (66000), and β-galactosidase (116000) were electrophoresed on a 12%-SDS polyacrylamide gel for 3 h at 100 V under non-reducing condition (without using any denaturants in the sample buffer). 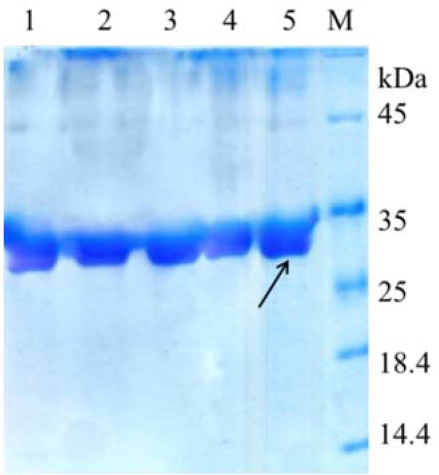 Proteins were visualized using Comassie blue staining . Standard EPO was used as control. OM was induced in Sprague-Dawley rats (5-6 weeks old, 200-250 g body weight) following three intraperitoneal injections of 5-flurouracil (5-FU) based on the protocol described in previous study . The maximum severity of OM was developed in all animals 7 to 9 days after the initial injection. The OM-induced rats were randomly divided into three groups of 5 animals each. Group 1 served as negative control and received normal saline. In the beginning of day 6 after 5-FU injection, 1 mL of freshly prepared EPO-loaded hydrogel or freeze-dried sample was applied twice daily to cheek pouch of the rats in the groups 2 and 3, respectively. Four rats did not receive 5-Fu and served as normal control group. The treatment protocol was continued up to day 16. Three rats from each group were randomly selected and killed on days 12 for histopathological studies. Approval for in vivo studies on healthy volunteers was obtained from the Ethics Committee of Isfahan University of Medical Science (Ethical committee ID: 194231). Six healthy volunteers aged 20-23 years, after the explanation of the experimental protocol, agreed to participate in the study and a written informed consent was obtained from each subject. All subjects were considered healthy on the basis of the story, physical examination, serum chemistry profile, complete blood count, and urine analysis. All subjects were abstained from smoking, eating, or drinking for 90 min after the application of formulations. The volunteers were divided into two groups. Group 1 received EPO-loaded TMC/GP hydrogel and group 2 received EPO solution. Salivary samples were collected by adsorbing the saliva with cotton swaps on the buccal area at 5, 15, 30, and 45 min after application of the formulations, and then the cotton swabs were placed in test tubes containing water . EPO concentrations in the samples were determined using EPO ELISA kit. 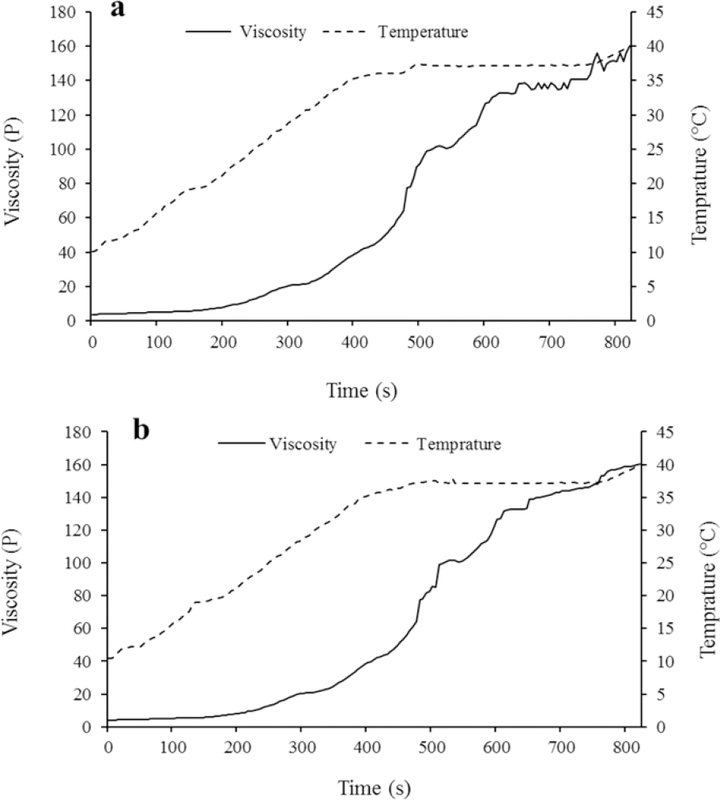 [Figure 1]a and [Figure 1]b shows the viscosity versus temperature and time for the freshly prepared EPO-loaded TMC/GP and freeze-dried samples, respectively. As shown in [Figure 1]a, TMC/GP solution began to transfer to gel state at 33 °C and the viscosity increased to 14000 cP at 37 °C during 3 min. 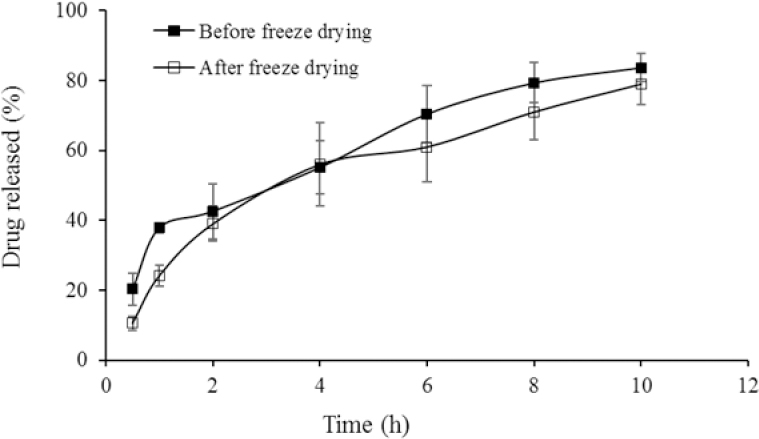 Freeze drying procedure did not significantly change the gelation time and temperature [Figure 1]b. Figure 1: Effect of temperature on the viscosities of (a) EPO-loaded TMC/GP and (b) freeze-dried EPO-loaded TMC/GP after 6 months storage. EPO, erythropoietin; TMC/GP, trimethyl chitosan/β-glycerophosphate. The work of adhesion of freeze-dried EPO-loaded TMC/GP system was calculated as 1102 ± 278 mN.mm (AUC) indicating the bioadhesive property of TMC/GP mixture. In vitro releases of EPO from TMC/GP system before and after freeze drying are shown in [Figure 2]. In either formulation, the drug content was completely released during 8 h and no significant changes in the burst effect and the drug release content from hydrogel before and after lyophilization was observed. Figure 2: The in vitro release profile of EPO from TMC/GP hydrogel before and after freeze-drying (mean values ± SD, n = 3). EPO, erythropoietin; TMC/GP, trimethyl chitosan/β-glycerophosphate. The conformational stability of in vitro released EPO from the freeze-dried hydrogel was assessed by CD. One h after initiation of the release experiment, the medium was withdrawn, and analyzed for EPO content using CD. The CD profile of EPO in the far UV range is shown in [Figure 3]. 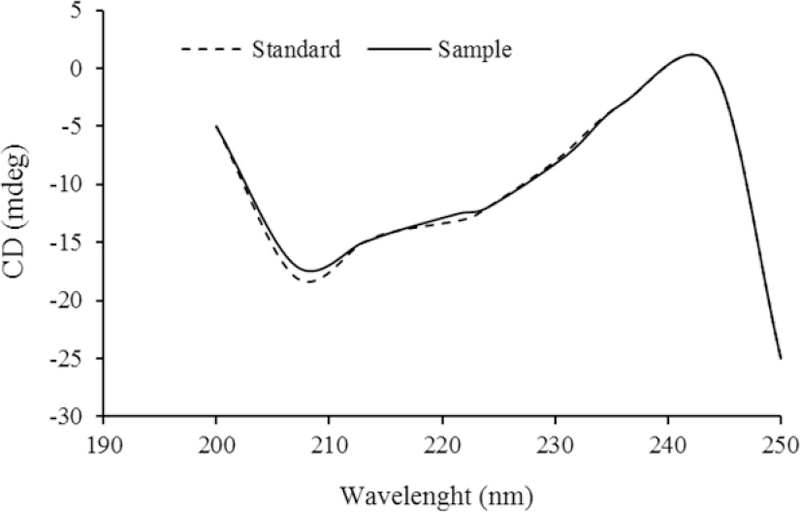 Figure 3: Far-UV CD spectra of standard and in vitro released erythropoietin from the hydrogel. UV CD, ultraviolet-circular dichroism. Evidently, two minima around 207 and 221 nm which is typical of predominant α-helical structure of EPO was unaffected by the formulation and freeze drying process and superimposed almost entirely to that of standard EPO profile. This suggests that the α-helical and secondary structures as well as physical stability of protein were maintained. [Figure 4] shows SDS-PAGE of standard EPO and EPO released after freeze drying. Aggregation or degradation bands or any extra band indicating difference in molecular weight between the released and standard EPO was not observed. This indicates that freeze drying and powder storage did not affect the structural integrity of EPO. Figure 4: SDS-PAGE analysis of EPO. M, Protein marker; line 1, freeze-dried EPO-loaded TMC/GP after 6 months storage; line 2, freeze-dried EPO-loaded TMC/GP after 3 months storage; line 3, freeze-dried EPO-loaded TMC/GP after 1 months storage; line 4, freeze-dried EPO-loaded TMC/GP after 1 week storage; and line 5, standard EPO. The arrow indicates EPO with approximately molecular weight of 30000 Da. SDS-PAGE, sodium dodecyl sulfate polyacrylamide gel electrophoresis; EPO, erythropoietin; TMC/GP, trimethyl chitosan/β-glycerophosphate. ELISA results indicated that the antibody binding activity did not unchange after freeze drying (91% as relative to EPO content of freshly prepared hydrogel). However, during storage for six mouths the activity was decreased to 79% compared to freshly prepared hydrogel. Severe mucositis was developed 7 days after the initial injection of 5-FU. Severity of mucositis were markedly reduced in animals treated with EPO hydrogel (freshly prepared and freeze-dried samples), whereas the group receiving normal saline did not show any significant healing effect on day 16. In histological sections [Figure 5]a, [Figure 5]b, [Figure 5]c, [Figure 5]d, various dilated and engorged capillaries, extensive infiltration of inflammatory cells, and hemorrhage were seen after 12 days in untreated animals [Figure 5]a in comparison with the intact healthy mucosa [Figure 5]d. However, significant re-epithelialization and wound repair was observed in both group treated with EPO hydrogel [Figure 5]b and [Figure 5]c.
Figure 5: Histological appearance of chemotherapy-induced oral mucositis in rats on day 12 (a) negative control, (b) group 2 received freshly prepared EPO-loaded hydrogel, (c) group 3 received freeze-dried EPO-containing formulation, and (d) normal control. All evaluations were performed on hematoxylin and eosin routine staining (× 400). There was no significant difference between the groups received freshly prepared hydrogel and freeze-dried gel which indicated the stability of EPO during freeze drying procedure and storage for 6 months. The saliva levels of EPO at different times after application of EPO-loaded hydrogel and EPO solution are shown in [Figure 6]. EPO released from both the gel and formulations reached the highest levels in 5 min after application. 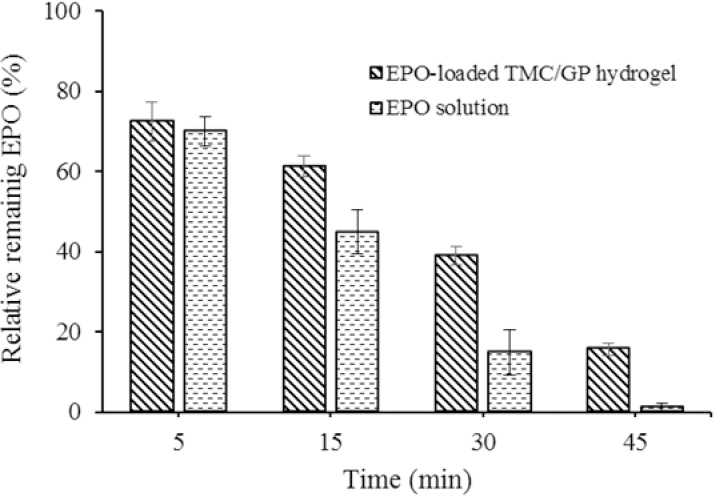 EPO salvia level was decreased rapidly using EPO solution compared to the gel. Approximately, 40% of EPO were maintained on the buccal areas of volunteers after 30 min in the group received the gel. Figure 6: Relative remaining of erythropoietin in buccal areas of healthy volunteers at different times (mean values ± SD, n = 3). EPO, erythropoietin; TMC/GP, trimethyl chitosan/β-glycerophosphate. OM is inflammation condition of oral mucosa as the results of chemotherapy and/or radiotherapy. Regarding the etiology of OM, it is generally accepted that some cytotoxic drugs such as 5-FU and methotrexate have direct inhibitory effects on DNA replication and mucosal cell proliferation which result in mucosal atrophy, collagen breakdown and ulceration ,. It is supposed that the main initiating factor of mucositis is the generation of ROS during chemotherapy and radiation ,. Based on animal and human studies, EPO effectively inhibits the production of ROS and lipid peroxidase ,,. Previously published studies have indicated the positive effects of EPO on treatment of chronic and acute wounds and burns in human and animals after systemic or topical administrations ,,. Hosseinjani et al. reported the effectiveness of EPO-containing mouthwash in prevention and treatment of OM in patients with Higuchi carcinoma. Because of the continuous saliva secretion in the oral cavity, the patients had to apply the mouthwash three or four times a day that would decrease the patient adherence to the treatment regimen . We recently developed a novel thermosensitive mucoadhesive gel containing EPO for prevention and treatment of OM . This formulation is liquid at room temperature and could be easily applied in buccal areas, while upon exposure to the body temperature it would solidify into the high viscous mucoadhesive hydrogel to withstand the removal action of salvia. The release rate of EPO from hydrogel was also hindered to avoid repeated administration and to improve patient compliance. The freeze drying process did not hamper the thermo-responsive and mucoadhesive properties of the optimized formulation. Moreover, stability of EPO in the freeze-dried powder formulation was evaluated using CD spectroscopy, SDS-PAGE, and ELISA techniques. Changes in the secondary structure of proteins are best monitored by CD spectroscopy. EPO is a glycoprotein composed of only α-helices . The CD spectroscopy revealed that the protein maintained its α-helical structure, it's secondary structure and physical stability. ELISA assay depends on the reaction of a predominant protein with specific antibody to form a complex. Because the antigen-antibody reaction is specific, antibodies are an important reagent for immunological research and clinical diagnostics. The ELISA method has very high sensitivity and specificity . ELISA antigenicity was considered to be an appropriate means for detection of potential changes of its antigenicity and tertiary structure. Therefore, we assumed that formulation and freeze drying technique did not affect the structural integrity and conformational stability of EPO. The aim of local drug delivery into the oral cavity is to provide therapeutic concentration of the drug at the required site. Here, the volunteers easily applied the formulation and more than 40% of EPO was maintained in oral cavity after 30 min. In general our developed formulation also offer advantages over the solid systems in attaching to the mucosa providing a widespread application in the mouth and achieve uniform distribution of the drug. TMC also offers an advantage over solution because of its inherent antimicrobial and wound healing properties ,. Results of in vitro and in vivo studies indicated that EPO-loaded hydrogel has a good potential in prevention and treatment of OM. SDS-PAGE, ELISA, and CD spectroscopy confirmed the stability of conformational structure of loaded and released EPO. When compared to the solution in healthy volunteers, TMC gel exhibited higher drug concentrations for longer time in the oral cavity due to its bioadhesive property. TMC also offers an advantage over solution because of its inherent antimicrobial property. The content of this paper was extracted from the Pharm. D thesis submitted by Marjan Amirian which was financially supported by the Research Department of Isfahan University of Medical Sciences, Isfahan, I.R. Iran via Grant No. 194231. Spivak JL, Gascón P, Ludwig H. Anemia management in oncology and hematology. Oncologist. 2009;14(Suppl 1):143-156. Sayan H, Ozacmak VH, Guven A, Aktas RG, Ozacmak ID. Erythropoietin stimulates wound healing and angiogenesis in mice. J Invest Surg. 2006;19(3):163-173. Hamed S, Ullmann Y, Masoud M, Hellou E, Khamaysi Z, Teot L. Topical erythropoietin promotes wound repair in diabetic rats. J Invest Dermatol. 2010;130(1):287-294. Galeano M, Altavilla D, Bitto A, Minutoli L, Calò M, Lo Cascio P, et al. Recombinant human erythropoietin improves angiogenesis and wound healing in experimental burn wounds. Crit Care Med. 2006;34(4):1139-1146. Haroon ZA, Amin Kh, Jiang X, Arcasoy MO. A novel role for erythropoietin during fibrin-induced wound-healing response. Am J Pathol, 2003;163(3):993-1000. Galeano M, Altavilla D, Cucinotta D, Russo GT, Calò M, Bitto A, et al. Recombinant human erythropoietin stimulates angiogenesis and wound healing in the genetically diabetic mouse.Diabetes. 2004;53(9):2509-2517. Ferri C, Giuggioli D, Manfredi A, Quirici N, Scavullo C, Colaci M, et al. Recombinant human erythropoietin stimulates vasculogenesis and wound healing in a patient with systemic sclerosis complicated by severe skin ulcer. Clin Exp Dermatol. 2010;35(8):885-887. Rezazadeh M, Jafari N, Akbari V, Amirian M, Tabbakhian M, Minaiyan M, et al. A mucoadhesive thermosensitive hydrogel containing erythropoietin as a potential treatment in oral mucositis: in vitro and in vivo studies. Drug Deliv Transl Res. 2018;8(5):1226-1237. Herrstedt J. Prevention and management of mucositis in patients with cancer. Int J Antimicrob Agents. 2000;16(2):161-163. Wang T, Hu Y, Leach MK, Zhang L, Yang W, Jiang L, et al. Erythropoietin-loaded oligochitosan nanoparticles for treatment of periventricular leukomalacia. Int J Pharm. 2012;422(1-2):462-471. Naughton CA, Duppong LM, Forbes KD, Sehgal I. Stability of multidose, preserved formulation epoetin alfa in syringes for three and six weeks. Am J Health Syst Pharm. 2003;60(5):464-468. Aksungur P, Sungur A, Unalc S, Iskit AB, Squier CA, Senel S. Chitosan delivery systems for the treatment of oral mucositis: in vitro and in vivo studies. J Control Release. 2004:98(2):269-279. Raber-Durlacher JE, Elad S, Barasch A. Oral mucositis. Oral Oncol. 2010;46(6):452-456. Saadeh CE. Chemotherapy- and radiotherapy-induced oral mucositis: review of preventive strategies and treatment. Pharmacotherapy. 2005;25(4):540-554. Oztürk E, Demirbilek S, Köroğlu A, But A, Begeç ZO, Gülec M, et al. Propofol and erythropoietin antioxidant properties in rat brain injured tissue. Prog Neuropsychopharmacol Biol Psychiatry. 2008;32(1);81-86. Guneli E, Cavdar Z, Isleke H, Sarioglu S, Erbayraktar S, Kiray M, et al. Erythropoietin protects the intestine against ischemia/ reperfusion injury in rats. Mol Med. 2007;13(9-10):509-517. Cetin H, Olgar ş, Oktem F, Ciris M, Uz E, Aslan C, et al. Novel evidence suggesting an anti-oxidant property for erythropoietin on vancomycin-induced nephrotoxicity in a rat model. Clin Exp Pharmacol Physiol. 2007:34(11):1181-1185. Hamed S, Bennett CL, Demiot C, Ullmann Y, Teot L, Desmoulière A. Erythropoietin, a novel repurposed drug: an innovative treatment for wound healing in patients with diabetes mellitus. Wound Repair Regen. 2014;22(1):23-33. Hosseinjani H, Hadjibabaie M, Gholami K, Javadi M, Radfar M, Jahangard-Rafsanjani Z, et al. The efficacy of erythropoietin mouthwash in prevention of oral mucositis in patients undergoing autologous hematopoietic SCT: a double-blind, randomized, placebo controlled trial. Hematol Oncol. 2017;35(1):106-112. Watson C, Sharp JS. Conformational analysis of therapeutic proteins by hydroxyl radical protein footprinting. AAPS J. 2012;14(2):206-217. Emami J, Hamishekar H, Najafabadi AR, Gilani K, Minaiyan M, Mahdavi H, et al. A novel approach to prepare insulin-loaded poly (lactic-co-glycolic acid) microcapsules and the protein stability study. J Pharm Sci. 2009;98(5):1712-1731. Tejada G, Barrera MG, Piccirilli GN, Sortino M, Frattini A, Salomón CJ, et al. Development and evaluation of buccal films based on chitosan for the potential treatment of oral candidiasis. AAPS PharmSciTech. 2017;18(4):936-946. Jayakumar R, Prabaharan M, Sudheesh KPT, Nair SV, Tamura H. Biomaterials based on chitin and chitosan in wound dressing applications. Biotechnol Adv. 2011;29(3):322-237.